At the beginning of each week you will be presented with a list of all of the games. 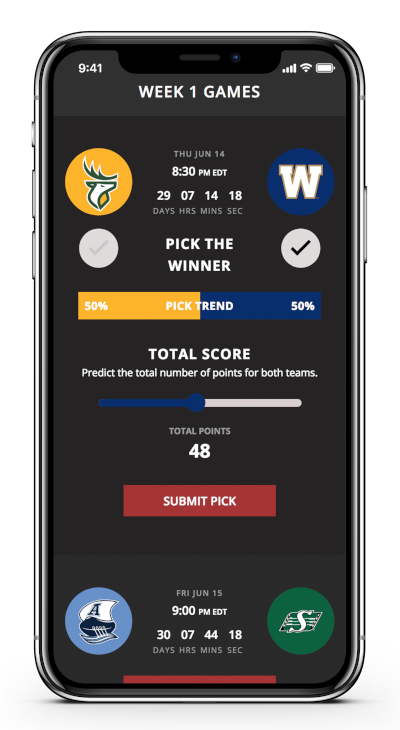 Select a matchup to make your pick and then choose which team you think will win. After you select a team you will be asked to choose your confidence level. The more confident you are about your decision the more points you can earn up to 100. This gives you the chance to increase your point total so you always have a chance to get back into the game. Use the confidence level wisely because the more confident you are, the more points you risk. Make an incorrect pick and you will lose all of the points you have risked. Picking the score of the game earns you more points on the leaderboard. Guess the right score, and earn up to a maximum of 50 points that count toward your total. 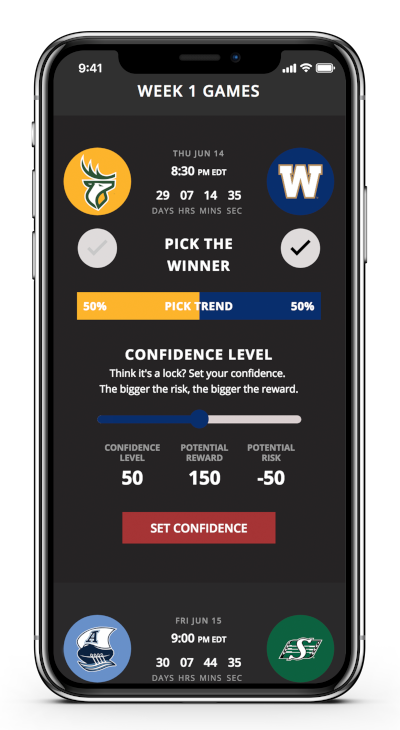 Players are presented with sharing screens each time they complete a task within the Pick’em experience. We encourage all players to customize their share messaging to tailor to those they are sharing with. Dominate the leaderboard with our multiplier and unlock a load of points with each consecutive 5 game win streak. The streak only ends with an incorrect pick, missing a game or a tie won’t affect it. See our breakdown below.